This exhibition proposes a study of line in space in the work of three artists: Darío Escobar, Ricardo Rodríguez and Enrique Castrejón. The line is not only the foundation of drawing but of other art disciplines, as the representation of a line in space marks delimitations as well as movement. 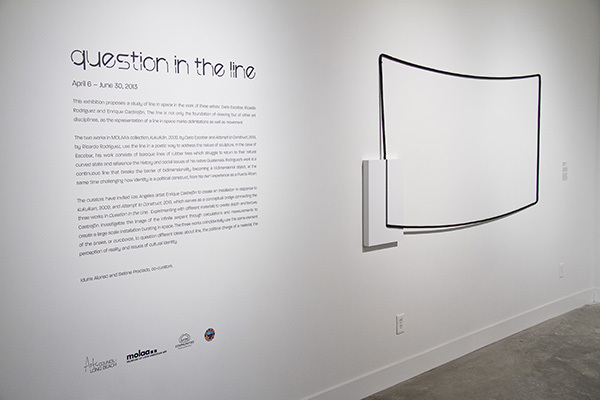 The two works in MOLAA’s collection, Kukulkán, 2009, by Darío Escobar and Attempt to Construct, 2010, by Ricardo Rodríguez, use the line in a poetic way to address the nature of sculpture. In the case of Escobar, his work consists of baroque lines of rubber tires which struggle to return to their natural curved state and reference the history and social issues of his native Guatemala. Rodríguez’s work is a continuous line that breaks the barrier of bidimensionality becoming a tridimensional object, at the same time challenging how identity is a political construct, from his own experience as a Puerto Rican.